Founded in 1993 when its members were students at the Royal Academy of Music, the Galliard Ensemble wind quintet have won many prestigious awards and performed in many of Britain’s major concert Halls and Festivals including the BBC Proms (as BBC New Generation Artists), South Bank Centre, Cadogan Hall, Wigmore Hall and Bridgewater Hall. Education is central to the Galliard Ensemble’s ethos. As well as working in higher education including University of Cardiff, University of Southampton, Royal Welsh College of Music and Drama, Royal Northern College of Music (ensemble in residence) and in schools; Highgate School (ensemble in residence) Chethams, Purcell School, Junior Guildhall, they believe that it is important to bring music to the wider community; in schools, day centres and nursing homes. 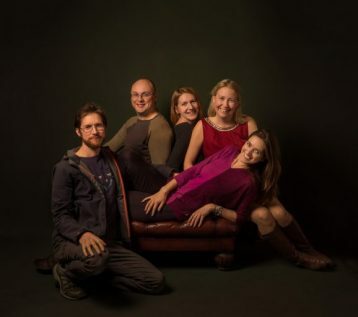 The charismatic and energetic, interactive performances by the Galliard Ensemble are enthusiastically received by many sections of the community who have not traditionally found classical music accessible or relevant. They also promote many educational activities mapped to the National Curriculum. The Galliard Ensemble has previously given a highly successful Key Stage 3 workshop at the Wigmore Hall. All members of the group also work as individuals in education, leading and planning workshops which have included a film project for a group of schools in Waltham Forest lasting over a year, an opera project in an inner city school (lasting a year) a 5-year project in autism and special needs for a school in Ilford and regular music and art workshops with outreach artist Ashley Davies from the Courtauld Institute of Art. Individual members of the group have additional specific training and experience to enhance their work with people with autism and dementia. They also founded the Galliard Composition competition, with a category for younger composers. The winners have been promoted in concerts throughout the country and on CDs. Central to this concert is the development of an informal, fun and encouraging atmosphere to fall in love with great music. Meet the whole host of animals in these pieces by singing sea shanties, playing musical games and conducting the ensemble. Help us compose music that the ensemble will perform to get the party going. Experiment with the different ways in which wind instruments make sounds and make lots of noise whilst being trumpeting elephants and go fishing for rhythms with Percy and Pete our two musical fish! This programme is based around music telling stories and there is something in it for all ages of children. We are delighted to kick off proceedings with a bang with a premiere of Kenneth Hesketh’s ‘The Grand Old Incy Wincy Din-Dan-Don’. The Hansel and Gretel sees the toddlers sitting quietly at the feet of the Wind Quintet for story time and Roald Dahl Dirty Beasts is a great romp for the older kids. There is plenty of variety with Villa Lobos’s atmospheric Dolls for solo piano and singing from around the world with Matthew Sharp. This concert consists of music for wind quintet and piano with spoken dialogue between the pieces both telling the story of the Three Little Pigs and introducing the instruments in turn. The narration is designed to be given by a single actor or by the six musicians themselves, who don appropriate dress to take on different roles in the story, their distinctive personalities giving the performance a highly individual character. The ideal age range of the audience might be from five to ten years old, yet it would appeal beyond that too. The occasion is both fun and instructive, with the instruments explained; there is interaction with the audience, including volunteers conducting the ensemble, and the whole audience clapping rhythms, playing singing and chanting games, and so on. Audience participation is central to the concert. The main musical piece and finale is Paul Patterson’s popular musical setting of Roald Dahl’s Three Little Pigs, originally written for orchestra and here adapted by the composer for wind quintet. Included in the programme are also selections from Jean Français’s L’Heure du Berger, the last movement of Farkas’s Antique Dances, an extract from Ligeti’s Six Bagatelles, Arvo Pärt’s Quintettino, Percy Grainger’s Lisbon and Walking Tune, one of Poulenc’s three Novelettes, arranged for wind quintet, Jim Parker’s Mississippi Five (Les Animaux), Norman Hallam’s Charleston from his Dance Suite. These pieces are all combined to set the scene for Three Little Pigs.